I love a good Greek Salad! Living in Asheville our neighbors owned a wonderful restaurant called Apollo Flame. We often visited their restaurant when we were craving Greek Salads, sandwiches, pastas or their amazing pizzas! Being four hours away, I needed to come up with my own version of a Greek Salad dressing. I actually made this salad dressing for My Carolina Today Executive Producer, Kim the first time we met in person. I also made my Chicken and Spinach Spanakopita and Baklava. Today I decided to make a Greek Tuna Salad for Mike and I and it was very delicious. Allowing the ingredients in the vinaigrette to marry is best, so try to make it earlier. I love eating Greek Salads with a side of warm pitas, too! In a large salad bowl, layer torn lettuces, cucumber, feta cheese, olives, tomatoes, red onion and the Pepperocini peppers. Chill until ready to serve. Make your tuna salad by combining tuna, mayo, salt, pepper and a splash of vinaigrette. Dress your salad with the vinaigrette when you are ready to eat. “Apoláf?sete” or enjoy! 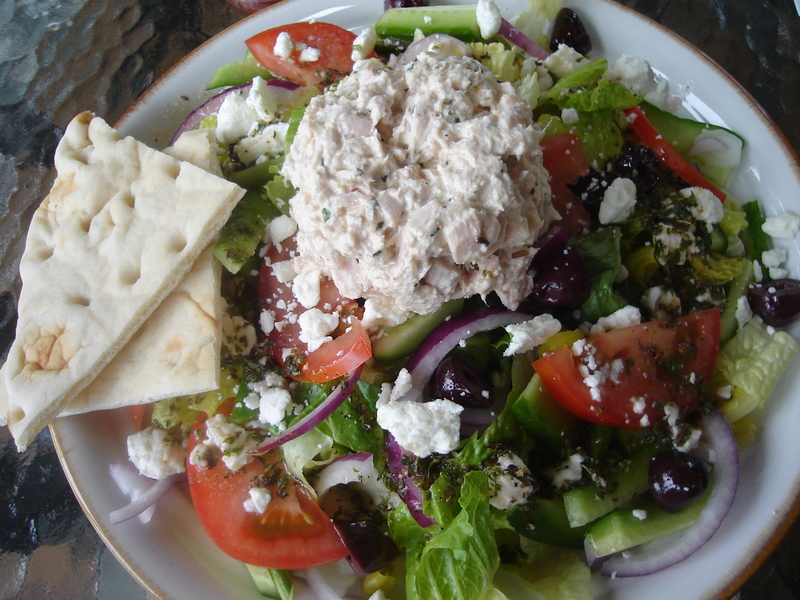 4 Comments on "Greek Tuna Salad"
That looks amazing! I love anything Greek! Thanks so much, Shea! It was refreshing and delicious; hope you try it and enjoy! Love your recipes! That looks like something I would just love. Delicious! Oh, I think you would just love it guys!